The Call of Duty: World War II season came to a dramatic conclusion last week, as Evil Geniuses won the grand prize. 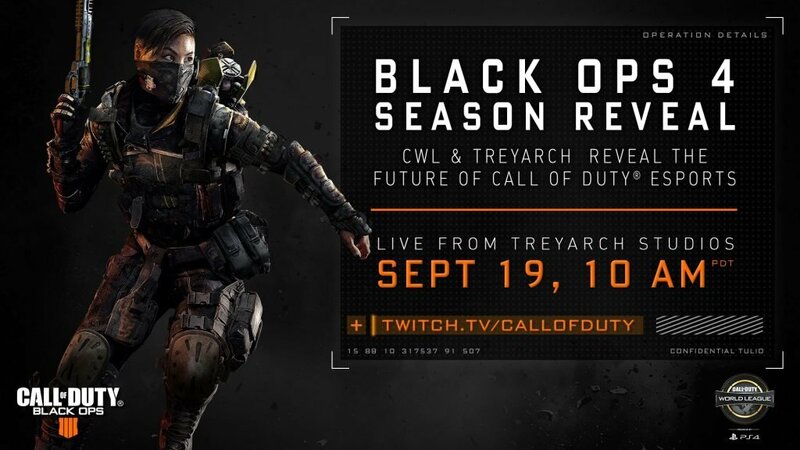 With the competitive season on hiatus, all eyes turn to Black Ops 4 (BO4), the new release planned for October 12th. There are rumours that Activision is ushering in franchising alongside its latest title. A concurrent switch to five players per side is also on the cards, but is this major change necessary or even viable? The speculation was fuelled by a recent interview with Dan Bunting, Co-Studio Head at Treyarch, the developer for BO4. Bunting mentions a “new competitive system”, and promises competitive players “will be surprised”. He goes on to add the following kicker: “I think 5v5 will appeal to competitive players”. These strong clues will be confirmed or denied on September 19th, during the official BO4 Season reveal. It appears the community mostly favours retaining 4v4, but there is a significant number of revolutionaries. The most commonly stated positive refers to the unification of the competitive and casual scenes. While “public matches” have traditionally been 6v6 – with competitive 4v4 – the downshift to 5v5 is being made for BO4. This offers a “meet-in-the-middle” potential for the competitive scene, closing the gap between the two communities. It’s possible that this would help introduce casual players to competitive, allowing tweaks to spawn and game mechanics to be more easily transferable; fixing issues quicker. However, there are surely far better incentives to get people into CoD esports, such as in-game rewards for watching tournaments and playing the competitive playlist. Simply matching player numbers offers little reason to become invested. Also, taking into account the more aggressive and intelligent style of pro players, there’s no guarantee early game problems will be comparable across casual and competitive play. Some cite the success of Counter-Strike and Dota 2 at 5v5 as proof that the grass is greener. These games work with ten players due to map sizes and pacing, just as Rocket League is 3v3, Overwatch is 6v6 and soccer is 11v11. Call of Duty’s maps and modes have always favoured 4v4; the BO4 beta’s maps remain highly traditional in size. The idea that 5v5 would allow more young talent to enter the pro circuit also has its flaws. As two-time World Champion Patrick “ACHES” Price explains, a team of pros is still highly unlikely to pick up an amateur (AM). 5v5 allows the richest organisations to stack “super teams” of top talent, reducing the competitiveness of the scene. The rich would get richer, while Cinderella runs of new talent would all-but disappear. And for the people that think it gives AMs more chance. Do you actually believe that? The pro players on teams will just shift and be poached, a few orgs would lose their teams bc lack of $. You wouldn’t see a team of pros all pick up 1 AM. Just so so delusional. The decision is already questionable at best from an external perspective, but there would also be profound impacts on gameplay. Search and Destroy has the potential to work, with more players allowing for more advanced strategies. Despite this, Black Ops 4’s well-documented high Time-to-Kill may encourage heavy team-stacks as in Infinite Warfare. 5v5 would only exaggerate this play style, reducing the effectiveness of well-timed flanks and promoting brainless team fights. The effects on the “respawn” game modes would likely be even greater. An extra player to account for at all times would add another layer of complication. Spawns would be significantly harder to control for players, and to balance for developers. Overwatch can function at 6v6 as the gameplay is generally one-directional, teams are always focusing forwards. Hardpoint allows for players to spawn behind enemy lines; 5v5 would only exacerbate the randomness of these events. CoD’s staple modes would surely require severe altercations to provide a comparable experience for fans. Hardpoint and Capture the Flag (CTF) would need heavy respawn delays to alleviate total chaos. Four players are hard enough to track in CTF, adding another would make sneaking through enemy territory almost impossible. Teams would be forced into a rigid CTF style, suffocating entertainment. On all fronts, the transition to 5v5 seems not only uncalled for but arguably destructive. Pandemonium would strike current rosters, with cash-strapped organisations worried for survival with such an announcement. 4v4 has worked perfectly for so long; what exact benefits are there from reworking this fundamental? If Activision announces this change on September 19th, following seemingly zero input from professional players, they’re going to need a dang good explanation. 5v5 would require a large notice before hand (a window they already missed) AND a guarantee it’s 5v5 for the rest of the CWLs lifetime. Players lose money (for sure). Hardpoint becomes a horrible game mode. All for “hoping casuals show more interest” Such a delusional idea. You can “Like” The Game Haus on Facebook and “Follow” us on Twitter for more sports and esports articles written by other great TGH writers like Arran!